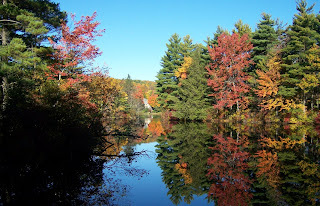 Have another look at my first Pines and Foliage post if you'd like to refresh your memory. You can also locate the pond on Google Earth via Coert's "Panoramio" site. 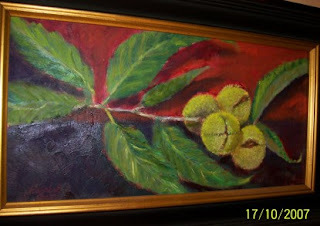 Here is one of my favorite paintings, "the Chestnuts". I have turned down a couple of offers to sell it wanting to save it for the "small painting" exhibit coming up..... Maybe I'll just keep it. Chestnut trees, as you might know, used to be abundant in New England. Around the turn of the century there was a "blight" and all the majestic tall trees died. My barn was built out of chestnut timbers and boards because of that. When I was a girl in the Netherlands my brothers and I would go chestnut picking all through the neigborhood. My brother climbed into the trees to beat the nuts out of them so I could harvest from the ground with my other brother. Now my brothers get together every year and have a chestnut feast together. Potroast, chestnuts, pears, brusselssprouts etc. Once, about 10 years ago I was in the Netherlands around that time and I joined for the festive meal. My son Coert has named a part of the forest he manages "Elisabeth's wood" because there are so many sweet chestnuts growing there. Grotere kaart weergevenThats where he harvests with his family. They roast them in their fireplace. Every year at the end of October I think of the chestnuts, and you can understand my surprise when driving in Princeton one day I saw these chestnut trees, small, about the size of apple trees. They tured out to be Chineese chestnuts. 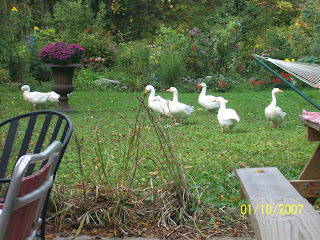 They are in the yard of the Mirick family, on Mirick road. John Mirick is very active in the organization to grow blightfree chestnuts for New England. The American Chestnut Foundation. Have a look and hopefully you too will appreciate the beauty of these majestic delicious fruit-bearing trees. Here are some some small paintings (approx. 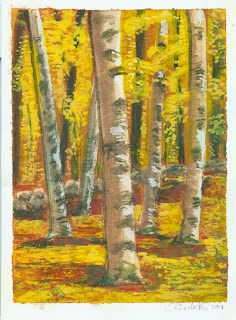 5x9 inch) I did with egg tempera... a really different way to paint. 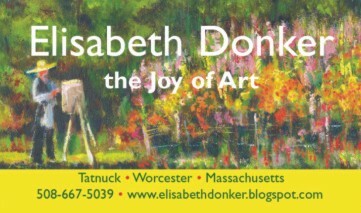 Usually I work in oil paint. 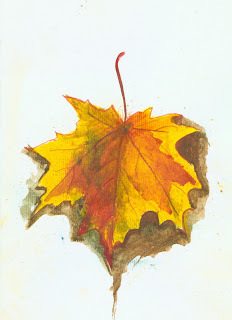 Egg tempera is mixing powder pigments with eggyolk. I particulary like it because we have chickens in the backyard, so fresh eggs are close at hand. I bought my pigments at the "Paintmill" "de Kat" on the Zaanse Schans they have been grinding pigments there since around 1782. At de Kat the pigments are ground from natural minerals. Pigements are easily obtainable in U.S. as well. 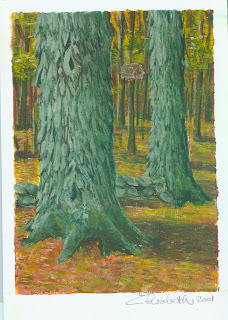 Painting with egg tempera is tedious, not big brush work. If anyone is more interested, please get in touch with me and I will get them started on the nitty gritty. You can als take a look at what Wikipedia has to say on the subject with a click here. Anyway, below are a birch-wood, a pair of Shagbark Hickorys and a Maple leaf. 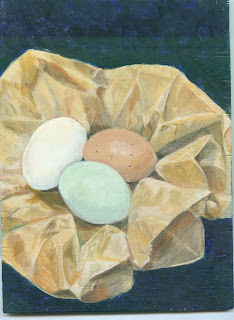 Up top, how could you paint anything in egg tempera without considering a basket of eggs? 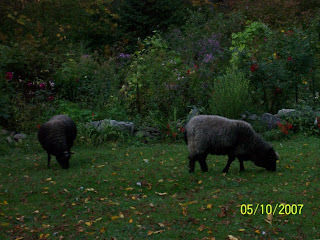 The sheep are running loose, it is the end of the season and they cannot do much harm to my garden anymore. My garden was breathtaking this year. The asters and dahlia's are still blooming and in the morning the blue morninng glories. To see them in the morning sun! In the foto with the geese you can see some and also the tall yellow flowers. The last hoorah of the blooming season. Click on the photo for an enlargement.